Tonight, one night late (aka Thirteenth Night), I unmade and dismantled our artificial Christmas tree. It is a bitter sweet experience for me every year. Not because I am a big fan of the pzazz of Christmas, but because each ornament on the tree has a story. For some reason this year it felt sadder than usual. My decorations fall into groups; there are the decorative trees to go on the tree, the reindeer ornaments, the angels, the round baubles, the nativity scenes,the hand made items, the stars and the wintery icicles. Then there is the long red camel ribbon that is twisted around the entire tree (miniature red pompoms on red braid). 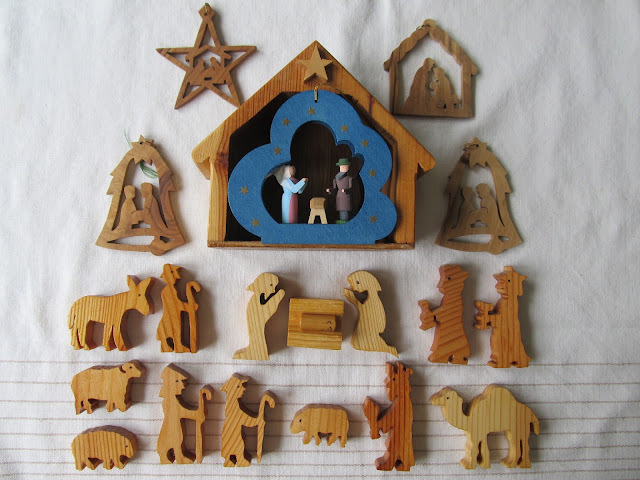 I thought of the Singaporean nurse working in Yemen who gave me my olive wood nativity set, and the German friend who sent a precious hand carved and painted nativity scene in birchwood as a wedding gift. A Viennese friend who has sent me two beautiful trees for my collection, and a university friend who hand embroidered a green and white tree. 18 years later her daughter made me angels from wired beads. There were the tiny snow men bought at an Amish fair in upstate New York and baubles painted with camels that I bought in a Middle Eastern bazaar. There are two crystal Swarovski snowflakes, mementos of my first job in NZ, and items bought for me by my mum, in a tradition we have had for years, buying each other a Christmas ornament. This year two new friends also added exquisite items to the collection. My angel at the top of the tree was from the Norwegian Seaman's Mission bazaar in Dubai and a few hand made items from when I was too poor to buy decorations, instead decorating my rubber plant with lights and ribbons. So many faces come to view when I remove the ornaments. People who have meant and do mean a lot to me. Memories of places from a wonderful past and a blessed present. A Christmas tree actually has nothing to do with Christmas, but the memories behind mine makes me so very thankful that I share this season with so many precious people near and far.